I don’t know if you knew this about me but I LOVE mushrooms. I think they are one of the greatest things out there, cooked, raw, mashed into a paste anyway you can think it up I want to eat them. So a couple of weeks ago during a meal prep day I decided to make some delicious Many Mushroom Risotto, and it was so tasty! Just for the fun of it I made this one vegan and trust you don’t lose any of the delicious creaminess or flavour you would get had I used butter and cheese, plus it cuts the fat/calorie content so it ends up being a super healthy meal. Enough talk, I am sure you are all salivating so here is the recipe, I hope you enjoy it as much as we did. 1. Prepare all ingredients so that you can easily toss them in, a lot of stirring is involved and you don’t want to let your risotto burn because something wasn’t already chopped up. 2. Heat half the oil in a large skillet or stew pot. Once oil heats up add in all of your mushrooms, cook them down until they are soft 5-7 minutes. Once cooked remove and set aside. 3. Add other half of oil to pan and heat, once heated add in leeks, onions and garlic cook for 2-5 minutes until the onions become soft and translucent. 4. Add in arborio rice stir in dry rice for about a minute to coat with all the juices that are going on in the pan. Add in 1 tbsp of lemon juice, stir until evaporated. 5. Add 1/2 cup of broth to the rice mixture and stir until completely absorbed, then add in another 1/2 cup of broth. Continue this until all of the broth is gone, stirring constantly. This should take 20-25 minutes and is a great arm workout, for one arm at least. 6. Once all broth is added into the mixture add the cooked mushrooms, fresh thyme and salt and pepper to taste. Stir until well combined and serve immediately. *these sizes are just one prepackaged container of mushrooms, also if you want to add more go for it, it will be super delicious! Let me know what you think of this recipe. I hope to be back blogging on a regular basis shortly. School is starting to calm down (not really but I keep telling myself this) and my work and life schedule is starting to actually find a nice balance. I hope to bring you more updates, workouts, yoga routines and recipes soon. 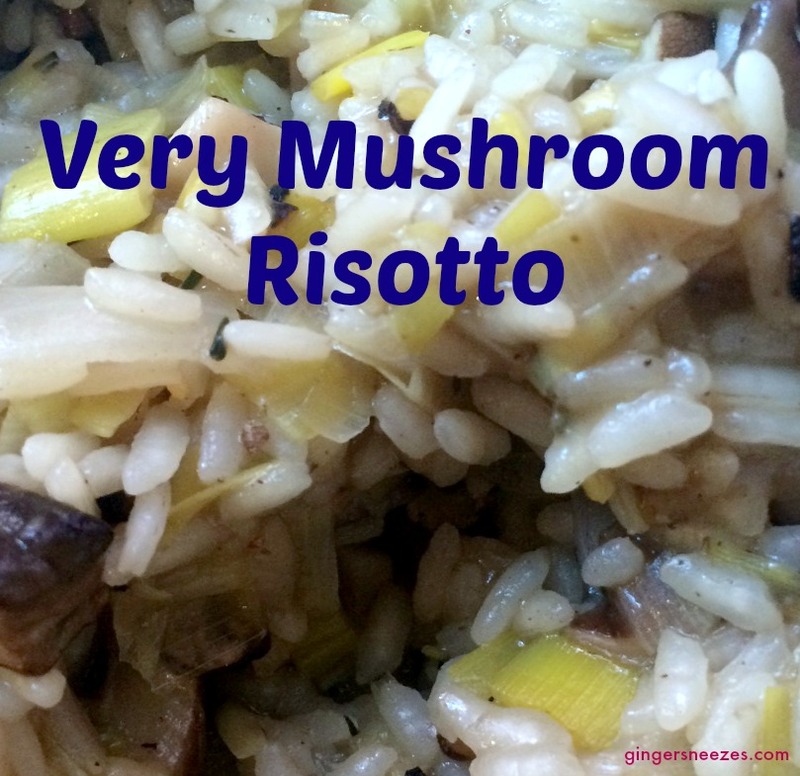 This entry was posted in Food and tagged dinner, food, healing, healthy, holistic, immune supportive, mushroom, risotto, supper, support, vegan by healingginger. Bookmark the permalink.